We're doing it again, Charlie. Happy New Year, Tiger fans! And by “New Year”, I mean the beginning of spring practice for Auburn and the true start of the new football calendar. And by “Happy”, I mean joyous, ecstatic, and infinitely excited. The grass is cut, the pads are strapped on, the sleds are being pushed. Football is in the air on the Plains. To celebrate, we’ve decided to pull together all of the best news and notes from the whirlwind of information coming from the Auburn beat yesterday. It’s a little thing you may have heard of before called Notes from the Beat. Before we do, be sure to click over and thank your friendly neighborhood beat writers — Andy Bitter, Jay G. Tate, Charles Goldberg, and David Morrison — for their excellent work kicking off this spring. All of the reporting is theirs. – There are a lot of new faces around the complex. Which is understandable, as Auburn is trying to replace 35 scholarship players from last year’s national championship team. But one of the most important new faces isn’t a player; it’s new defensive line coach Mike Pelton, who replaced the departed Tracy Rocker just earlier this month. In yesterday’s interviews Ted Roof called the switch from Rocker to Pelton a “seamless transition”. Pelton also pointed out that his first coaching gig was as a GA under Rocker at Troy (something that most of us somehow missed the first time around) and that he shares Rocker’s methodology, even going as far as calling Rocker his “mentor”. He also let us know how serious he is about being back on the Plains: “This is personal to me. It’s not just a coach coming back, it’s about a guy coming home.” Welcome home, Coach Pelton. – Of course, the questions everyone is asking, just like every other year, are about the situation at quarterback. This year’s annual spring quarterback battle is between Barrett Trotter and Clint Moseley. While it’s going to be tough for either of them to replace The Cam Newton (Trotter: “He didn’t leave shoes to fill, he left skis to fill.”), there is always plenty of reason to be excited about the quarterback position when it’s being coached by one Gustav Malzahn. And unlike Cam Newton and Chris Todd (who made an appearance yesterday) both Trotter and Moseley will have had years of experience in the Malzahn system before getting their shot at the starting job. – Incoming freshman Keihl Frazier appears to be out of the picture for now, at least as far as being the Game 1 starter. As Andy Bitter points out, Malzahn said that he will definitely have a starter named in the fall, the deadline being two weeks before the opener against Utah State — at which time Frazier will have had just two weeks of practice. Malzahn also pointed out that this year’s starting quarterback will be his sixth starter in six years of coaching in college. He and Jason Campbell should hang out some time. – In position change news, Neiko Thorpe has made his move to safety. It should work out, because according to Roof, Neiko’s best attributes are in his range and his vision. And that’s very true. The change makes perfect sense. I expect big things out of Thorpe at safety. Go ahead. Watch the tape again – and again and again, and then imagine that the defense has been stretched, winded, and exhausted by the Malzahn no-huddle before that truck gets thrown at them… slowjams to our orange and blue ears. – In really awesome comeback news, the Wildcat is back, baby. “I perceive that we’ll have a true wildcat guy and not use our quarterback like we did last year,” said co-innovator Gus Malzahn. Did you hear that, Trovon Reed? Also, A.J. Greene is back and ready to go, almost at 100 percent after breaking his tibia and dislocating his ankle early last season. Greene will presumably be back at right tackle while Brandon Moseley, who stepped in to replace him for the rest of the year, will move over to left tackle. Finally, Aubrey Phillips returned, suiting up as a walk-on for the Tigers. 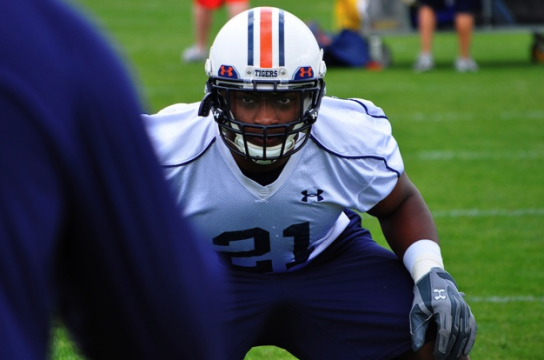 When he left the team in the middle of the 2009 season because of some non-football medical issues, it was doubtful that he’d ever be able to strap up for Auburn. But sometimes good things happen. Imagine that. He’ll be right in the mix for a starting job on the line, and truthfully, if he has a solid spring, right in the mix for earning back a scholarship this fall. After all, a few of Auburn’s scholarships opened up recently. Photo via Jay G. Tate. I’m convinced that smooth, silky slowjams just play wherever he goes.